During the London riots, one hacker reported returning home to a ransacked house to find his laptop missing. 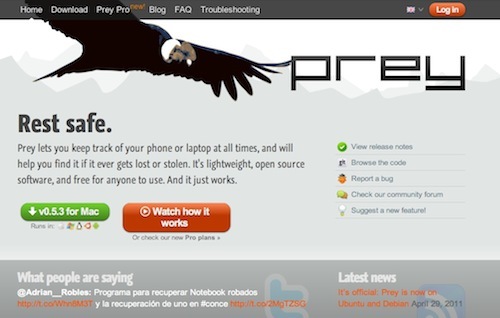 Luckily, he had previously installed Prey Project [ @preyproject ], an open-source laptop and phone tracker for Mac, Windows and Linux that helps people locate, secure, lock and recover information if a device goes missing. You could also spy on your kids' online activity (just sayin'). Postscript: the hacker got his laptop back, thanks largely to the thief logging into Facebook [ see our story on British police using social media to catch rioters ]. We were so intrigued by this story that we installed Prey on our laptops and tested it. Brilliant! Here's how you can set it up. If you have a Prey story, share it in the comments or email tips@launch.is. First, install the software onto the device in order to synchronize it with the control panel (see screen shot 1). Next, log into Prey's web-based control panel. You should see the device you just installed it on and a brief description of its current state. Click the green button to add another device (you get the first three free). If your device is missing, click on it from the main page. Under the "Current status" section in the "Main" tab, click "Yes" to mark the device missing and to start receiving reports (see screen shot 2 ). You decide how much time Prey should wait between each report and running actions, ranging from 10 to 40 minutes. Once a device is marked as missing, Prey notifies the user to expect a report in roughly 20 minutes -- but only as long as the device is connected to the Internet. Users can access the report via email or from the Prey control panel in the "Reports" tab (see screen shot 3). To determine what information Prey should gather for reports, navigate to the "Information to gather" section (see screen shot 4). Activating the geo function enables Prey to triangulate the exact location of the device using its internal GPS or a wifi hotspot. Activating the network function enables Prey to identify active connections, detect wifi access points on the device and trace the device's route to the internet. So what should Prey do? In the "Actions to perform" section, turning on the "alarm" function prompts the device to make a loud sound for 30 seconds in the event that it's nearby. The "alert" function notifies the thief that he or she is being tracked. Users can also remotely "lock" the device to prevent unauthorized use and "secure" it by having Prey delete emails, browser cookies and stored passwords from all accounts on the computer. Under the "session" category, select "get screenshot" to take an image of the current session and get information on modified files and programs currently running on the device. Turning on the "webcam" allows Prey to take an image of whatever or whomever is front of the computer's camera (see screen shot 5). Be sure to hit "save changes" when done.